Most of the roof repairs we make occur because of common problems that cause the roofing material to fail. Having your roof inspected on a regular basis will prevent small problems from becoming big ones. The most common and obvious cause for needing a roof repaired is leaks. Leaks may be caused by damage to or deterioration of the roofing material or a reason unrelated to the condition of the roof. Clogged gutters or eavestroughs are a common cause for water to back up under the shingles or other roofing material and leaking into the structure. Roof problems can be caused by poor ventilation. If your home doesn’t have adequate attic ventilation or if your home’s soffits aren’t properly ventilated you could have a problem with moisture that can over time cause damage to the underside of the roof. If your home’s roofing material is low quality it won’t last as long or might become damaged more easily in stormy weather conditions. Another problem that can cause the need roof repairs is poor quality workmanship. When choosing a roofing company be you check references to make find out the satisfaction of previous customers. Ignoring small problems can turn into big problems. Repair small problems when they occur before they have a problem to become larger. Regular roofing inspections will keep your roof in top condition. Never make repairs using materials that aren’t intended for your type of roofing. If you are unsure how to make a repair make sure you hire a reputable contractor to do the repair. The professionals at iRoofing Toronto have experience with all types of roof materials and the proper way to make repairs. Storms and strong winds can damage roofing material. If you notice damage to shingles after a storm or if tree branches have fallen on your roof during the storm take proactive steps to make sure your roof has not been damaged. Client can inspect your roof using a scheduled inspection plan or if you believe your roof has been damaged. 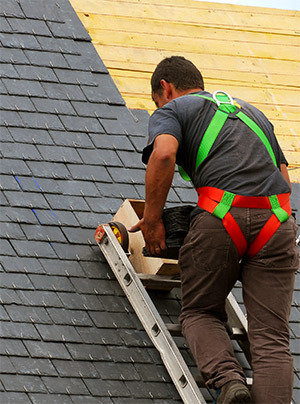 The professional roofing contractors at iRoofing Toronto will be able to determine the cause of any roof leaks and advise you on the best course of action to make the necessary repairs. Call us today (416) 477-1070 to schedule a roof inspection.